November 2, 2014 Kathe Skinner, M.A., L.M.F.T. Every zombie has a family. And on the first and second days of November that zombie’s family, and thousands of others throughout Mexico, is honored in a celebration with 3,000 year old roots – Dia de los Muertos. Like an Irish wake or an African-American jazz funeral, Day of the Dead is a combination mourning and celebration held to honor those who have died. Entire cemeteries are cheery with flowers, lit by bonfires and candles that brighten feasts of the dead’s favorite foods. Tequila flows freely and stories are told that relive families’ histories. Dia de los Muertos remembers and honors the players in a family’s past, keeping history alive from generation to generation. Proliferating like Mexican restaurants, Dia de los Muertos has taken hold throughout the non-Latino world. What may account for its popularity is how colorfully and cheerfully death and rebirth are celebrated – music, traditional food and drink, and art highlight what is, in many places, a community-wide event. Lacking Mexicans’ cultural traditions, though, many people north of the border live in an existential funk, lacking a sense of who they are or what they want. Feeling directionless, without a sense of family or personal continuity, makes knowing where you fit in the Grand Scheme of Things impossible. Both you and your family, even an entire culture, can disappear when there’s collective amnesia about the past. In my psychotherapy practice I talk with people who’ve been amalgamated into a fractured mainstream, one whose one size doesn’t fit everyone, inevitably too broad for too many to wrap their arms around. “Where have I been and where am I going?” are unanswerable when we appear out of nothing; phantoms are figments that have no future and no past. They just “are”, with no “was” and no “will be”. That’s how lots of us feel. It’s surprising that many of my clients have no knowledge of their roots. How each of us came to be who we are is multi-layered and multi-populated, providing the best answer to the question we asked from the time we could talk — why? That everyone in a Mexican community is celebrating the same thing further cements inclusion, a sense of belonging; it’s what many of us missed in our own families of origin. In community there’s support as we mourn the many losses in our lives — family, friends, pets, our very ways of being in the world. There is mutual support in sickness and in health, in sorrow and joy. These are the two sides to the existential coin. Zombies, acquainted as they are with the dead, are the only ones who can help resurrect families’ missing histories. Knowing that Grandfather was a mean drunk whose third wife was passive helps us understand reasons for our own passivity, alcoholic behavior, failures at marriage. There’s a Mexican saying, Hay más tiempo que vida — There is more time than life. Maximizing time on this side of the doorway is helped by knowing how we came to be who we are. These are the ongoing tasks of our lives: To get unstuck from feeling alone by getting acquainted with the generations inside us. To utilize that acquaintance to fill in the outline of the lonely singular “me” with the fleshed out, colorized pictures of “us”. To provide reassurance in our times of trouble that they, too, had troubles. Here’s what zombies can teach us about family history: the more information gained, the more stories listened to, the more secrets unknotted, the greater the perspective we have. With information and perspective comes the sight we need to make choices on our own behalf. The better we know and understand our predecessors’ successes and mistakes, the freer we become to design and live our own present and future. And, as every wise zombie knows, sometimes a bit of mourning has to happen before the party can begin. 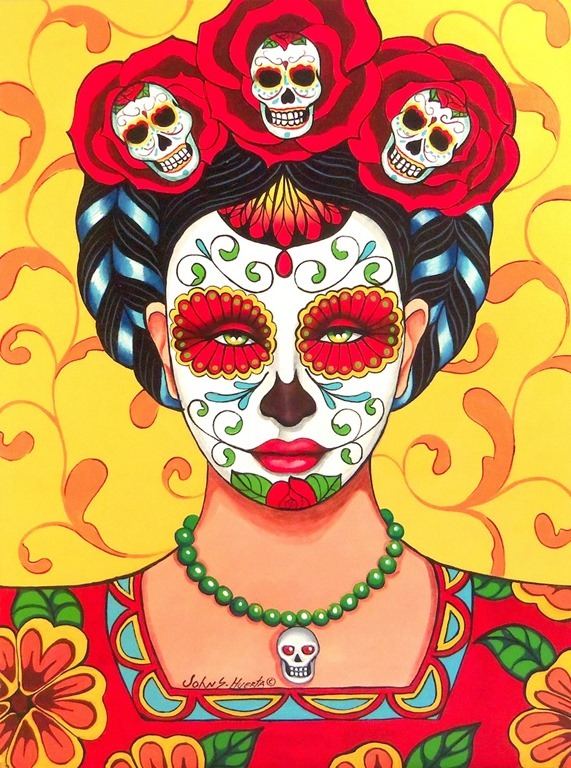 Copyrighted by Mexican artist John Huerta, who uses the style of Day of the Dead to illustrate the women in his life who’ve died.